This has got to be one of our favourite projects to recommend in a long time. 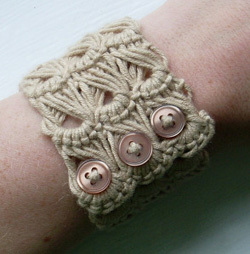 This crochet lace bracelet from Cult of Crochet is super chic. This crochet technique, termed broomstick lace, gives a delicate lacy effect. Try it in different yarn colours to match your wardrobe. The step-by-step instructions include great photos to make it easier. But note, the instructions have been adapted to cater for left-handed crafters. Head to Cult of Crochet for these instructions. If you want the original instructions, head to Daylilies Creative. So, no excuses – both left-handed and right-handed crafters are catered for. One way of determining the weight of an unknown yarn is to use the wrapping method. Wrap the yarn around a large needle or a ruler. Make sure the yarn lies flat. Push the yarn together so there are no gaps between wraps. Smooth it out so it is neither too loose nor too tight. Measure the number of wraps per inch (2.5 cm). For better accuracy, measure the wraps at the centre of your yarn sample.